Created by: Scott Lobdell and John Romita, Jr. Skills and abilities: Trained in armed and unarmed combat as well as infiltration by the X.S.E. Powers: Shard is able to absorb ambient light particles and convert it for a variety of effects. She can fire concussive blasts, combust portals opened by Trevor Fitzroy and fire photonic energy from her hands. As a Photon based life form she had the ability to phase through solid objects and possess others though the latter was under developed. She also had no need to eat or sleep. Shard was born eighty years in the future in a concentration camp located in New York to mutants Kadee and Burnum who were of Aborigine descent [X-men: The Times & Life of Lucas Bishop #1]. Her parents had managed to escape their native Australia before it was subject to a nuclear missile strike. Three years after her brother Bishop was born she entered the world. Her father was their primary caregiver in these early stages of life as her mother grew distant, cold and militant. Burnum also tried to pass on Aboriginal culture to his children but didn’t know enough to do so effectively and Shard was too young to understand. In the camp she also met a ‘grandmother’ who helped take care of them [X-men: The Times & Life of Lucas Bishop #1]. During the Summers rebellion both her parents were killed and her brother escaped [X-men: The Times & Life of Lucas Bishop #1]. For the next several years she remained with her grandmother at a concentration camp now relocated to Las Vegas. Here she was reunited with her brother Bishop when he was later captured. When the government later freed the mutants during the emancipation they were kicked out onto the streets [Uncanny X-men Annual 1996 and X-men: The Times & Life of Lucas Bishop #2]. A year later their ‘grandmother’ died and Bishop promised her he would take care of Shard at all costs. Using new skills her brother made a life for them on the streets. Mutant rebels known as the Exhumes had then taken root and the X.S.E Xavier’s security enforcers had been created by the remnants f the Summer’s rebellion to police their own. When Bishop is offered membership into the X.S.E as a cadet he accepts on the condition that his sister may join as well [Bishop #3]. As a recruit she was in the same class as Trevor Fitzroy, heir to the Hellfire Club. Much to her brother’s dismay she shared a whirlwind romance with Fitzroy [X-Factor v1. #140]. After surviving an attack by ‘Emplates’ her brother became the youngest cadet to become an X.S.E officer. A year later Shard would beat his record [X.S.E #1-2]. Fitzroy would defect from the X.S.E and she eventually also outranked her brother and became a commanding officer. On a mission to an enclave where Exhumes were hoarding weapons left from the Summers Rebellion she first met Fixx, Archer and Greystone and voice dissatisfaction with the methods used by the X.S.E [X-factor v1. #140]. Going to a secret meeting with Fixx, Greystone and Archer she was convinced that their plans to use time travel to alter the future was the best course of action. That night she was telepathically linked to the trio as she joined the X.U.E, Xavier’s Underground Enforcers [X-factor v1. #140]. That night she learned that Fitzroy had the power to open time portals and was forming his own crew of Rogue mutants. Going against everything she had been taught she captured Bantam, Fitzroy’s sidekick from X.S.E custody and through intimidation tracked down her former lover [X-factor v1. #140-141]. Upon capturing him she revealed their plans and that she still had feelings for him. He turned on them however and after he was defeated she took him to the X.S.E and left the X.U.E [X-factor v1. #141]. She fell out of contact with the X.U.E and later died in an ambush by Emplates after getting a tip from Bishop. As an Emplate she attacked her brother and his team. Rendered unconscious she was taken to Lebeau where her essence was saved in a holographic projector before her body died [X.S.E #3-4]. When Bishop became stranded in the past of Earth 616 he had Forge help him to fix the Holographic projector which housed her consciousness [Bishop #1-4]. Bishop then met with his sister who had been made a hard light projection thanks to Forge. At first he refused to accept her as his sister but when the projector was destroyed she reformed as a Photon based life form. Bishop finally accepted that she had returned [X-men Annual 1996]. Falling back into old roles Bishop demanded she join the X-men but she refused deciding that she would not follow in his footsteps the way she had before, reluctantly Bishop allowed her to find her own way in the world free of his interference [X.S.E #1-4]. She would join the Government sanctioned X-Factor and shared mutual attraction with teammate Wildchild [X-Factor v1. #117-119]. Multiple Man was also attracted to her [X-Factor v1. 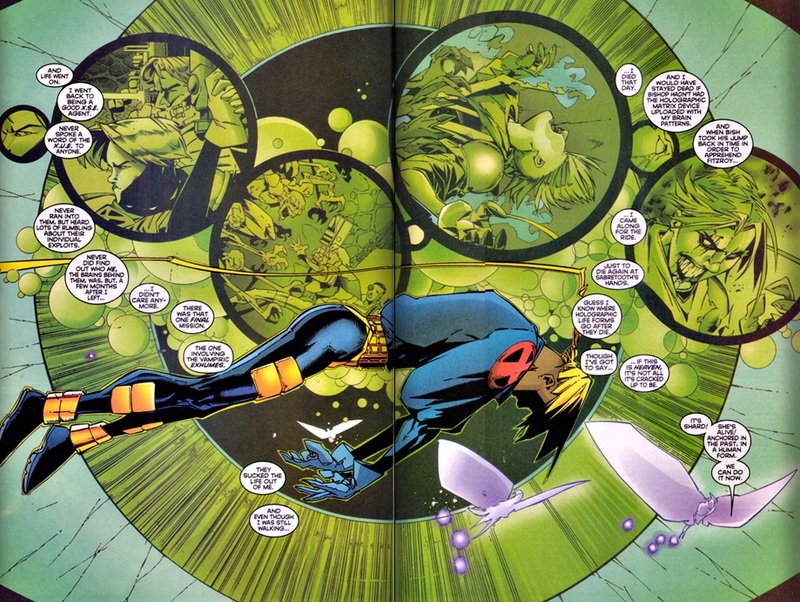 #129] and they bonded at the graveside of one of his duplicates [X-Factor v1. #132]. When the team broke away from the Government she joined them. Forge also planned to use her memories as a means of trying to avoid her future timeline from coming true [X-Factor v1. #132]. When they lost control of Sabertooth she was slashed through the lower abdomen while trying to protect Polaris and she dissipated [X-Factor v1. #136]. She woke up while in possession of Polaris’ body confused before she was sedated [X-Factor v1. #138]. While still inside Lorna she remembered the plan of the X.U.E and the events leading to her ‘death. She also witnessed them travel back in time via Fixx’s ‘fairies’ before she jumped out of Lorna’s body [X-Factor v1. #140-141]. Hunting down the X.U.E she joined with Havok in the Morlock tunnels [X-Factor v1. #143]. After a brief skirmish they joined forces to battle the Dark Beast and save the people on whom he was experimenting [X-Factor v1. #144]. 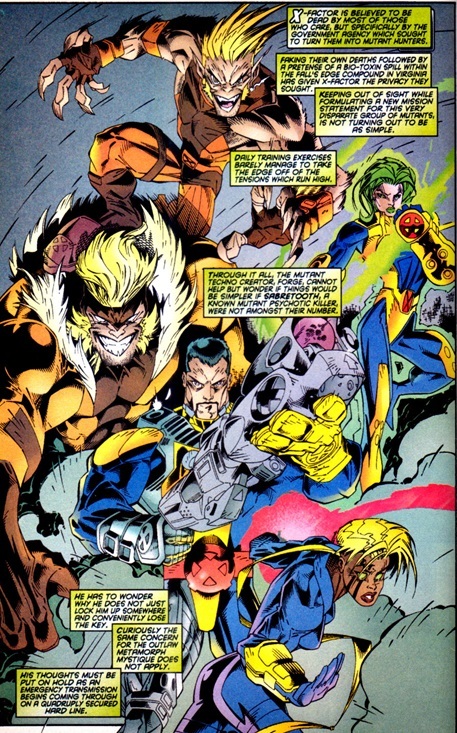 With Havok they created a new X-factor when the previous one disbanded [X-Factor v1. #145]. Shard also met with Anti-mutant hysteria which left her deeply disturbed [X-Factor v1. #147]. The team disbands when Greystone and Havok die in an explosion of a time traveling ship [X-Factor v1. #149]. She was later captured by Fitzroy into an alternate timeline where she was held prisoner. Here Fitzroy revealed he still had feelings for her. Fitzroy also told her Bishop was dead and so they only had each other [Bishop The Last X-man #2]. He played with Shard’s yearning to be human once more in hopes of having her serve him [Bishop The Last X-man #9]. Shard later learns that Bishop is alive when Bantam realizing that Fitzroy had descended into madness tried to have them both escape [Bishop The Last X-man #10]. Shard refused, too weak to use her phasing abilities. Fitzroy again came to tempt her this time telling her Bishop was alive and that he could save them all [Bishop The Last X-man #11]. In his final temptation Fitzroy offered to make shard human once more and she accepted. When Bishop came to save her she sided with Fitzroy, seemingly enthralled by him and Bishop was defeated [Bishop The Last X-man #12]. Bound and chained so he could kill her brother Shard unable to access her mutant powers finally finds the strength to reject Fitzroy’s gift. Severing her arm at the elbow she made her way to Bishop and converted her body into energy which he absorbed to kill Fitzroy. Unfortunately Bishop used her to shoot at Fitzroy but she entered the portal Fitzroy had created [Bishop The Last X-man #14]. She is assumed dead.